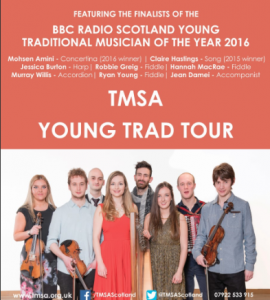 The TMSA Young Trad Tour kicks off tomo rrow with our first gig at the Tower in Helensburgh. You can expect some brand new material, arrangements of traditional tunes and catchy songs, all of which we will be recording. The album will be available to purchase from July onwards. Make sure to check back for updates! Tickets will be available to buy on the door and are £10/8 concession. Hope to see some of you there!